A Jesuit moment. There are moments when our Jesuit identity seems almost tangible. Last Saturday was one of these moments. Together with friends and collaborators the Dutch and Flemish Jesuits were assembled in Antwerp to celebrate the start of the new independent region of the European Low countries that replaces the former Dutch and Flemish provinces. It was also the moment of the pronunciation of the last vows of two Jesuits. The presence of Jesuit guests from Dublin, Paris, London, Congo, Amsterdam, Rome and Brussels underlined the importance of this celebration. Fr. Victor Assouad, general councillor represented Fr. General Arturo Sosa. 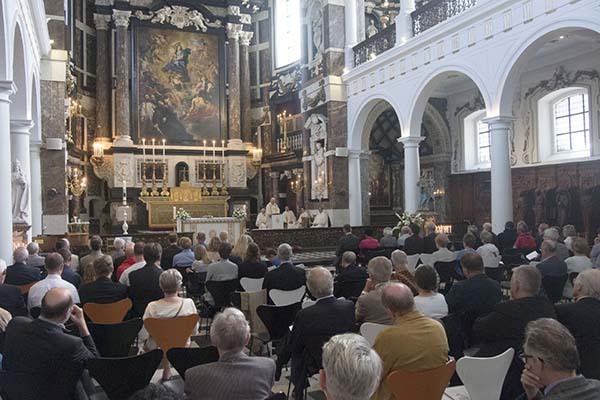 During a solemn mass in the former Jesuit Church of Antwerp, St. Charles Borromeo, the new regional superior, Johan Verschueren drew an image of this new region as a realistic and hopeful opening to the future with a sad note for the loss of the two provinces. A sad note also because it is clear that the numbers of Jesuits is shrinking. The regional superior pointed out where our focus lies: in the dedication of people for Gods work. This became confirmed in the pronunciation of the Vows. When I heard Wiggert Molenaar, a Jesuit brother pronounces his commitment to Christ in the Society and Ward Biemans, a Jesuit priest added the obedience to the pope regarding the mission, I felt a deep gratitude. Gratitude for these so committed people and gratitude for being a member of this society. It showed for me what is central in our vocation: our commitment to Jesus in his salvific work. 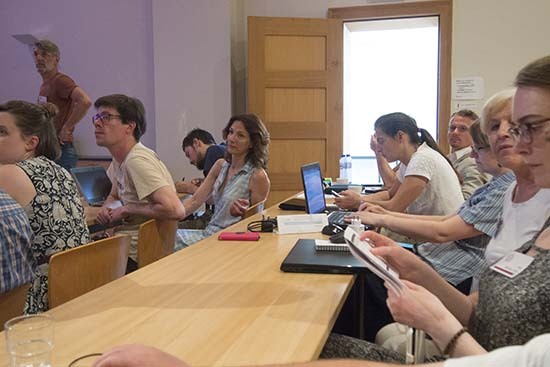 A Communication Training for not specialized Jesuits and co-workers: a challenge for those working in the pastoral, spirituality and social areas, but also for the communicators proposing an adapted useful program. 20 Jesuits and co-workers from Great-Britain, Ireland, the Netherlands and Flanders spent three extremely hot days in the coolness of the Old Abbey in Drongen near Gent, at the end of June. There was little theory, apart from an introductory session by “internet chaplain” Nikolaas Sintobin, but a choice between 5 workshops. No doubt, those who actually are working in area of Vocations, Jesuit Missions, Jrs… are eager to communicate in a digital era. The opportunity to participate in small groups in workshops, guided by specialist was really appreciated. The proposed workshops were: “Photography for the digital environment” (Ruth Morris, London), Achievable audio & video content (Guido Attema, Amsterdam), “Writing opinion pieces/blogposts/reflections” (Anton de Wit, Nijmegen), “Success in social media” (Sim d’Hertefelt, Brugge), “Who do you think you are talking to? – Why language matters” (Stephen Noon, Birmingham). On the last morning Jane Hellings (gbsj, London) provided an overview and some reflections about the technical communications. Participants gathered in interest groups and shared about future collaboration, at Province and Assistancy level. Participants were invited to use the camera of their smartphones and make remarkable shots of the Old Abbey, or to write a column on a news fact that more young people are attracted to belief after visiting a church. Vocations promoter Walter Ceyssens found it a useful Training Conference: "This was a very helpful meeting indeed. My online competences which barely are above level 1, were upgraded. Furthermore the session met the need to gather the Society's digital expertise of Jesuits and especially lay collaborators, which is often scattered". 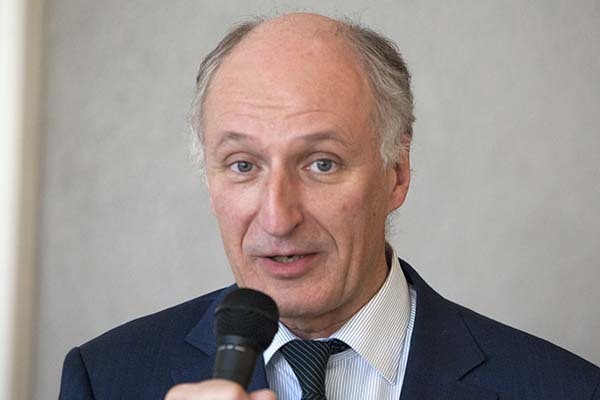 Fr General has approved the creation of a new Independent Region of the European Low Countries (ELC) which will take effect on July 31 this year. The new Region will comprise the goods, works and houses of the current provinces of The Netherlands and North Belgium (Flanders). Fr Johan Verschueren, current provincial of these two provinces will be the major superior for a period of at least three years - unless an arrangement is made concerning the restructuring of Provinces in the West European Assistancy in the meantime. Fr Verschueren will complete five years as provincial in August 2017. 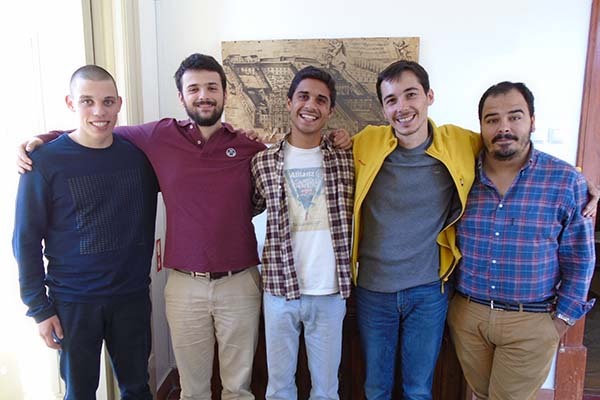 When the two provinces merge to become the new Region there will be 60 Jesuits in The Netherlands living in two communities: Amsterdam and Nijmegen. 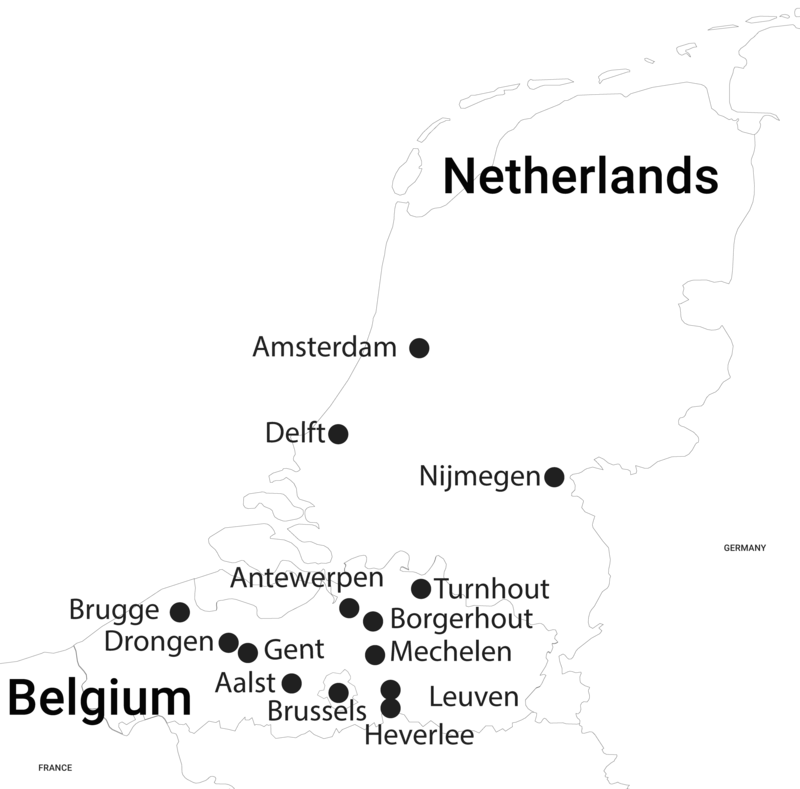 14 members of the Dutch province live abroad, of whom five in Flanders. 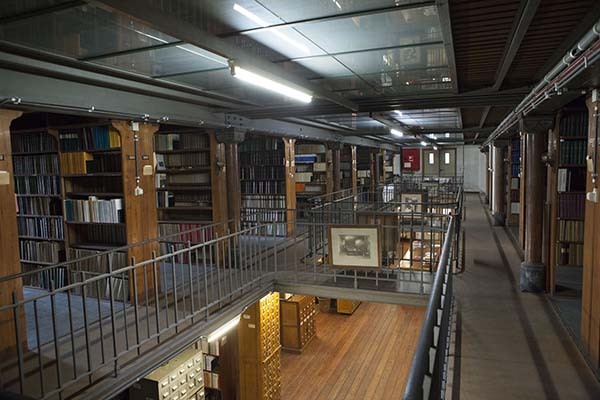 In Flanders are residing at present 108 Jesuits in eight communities. 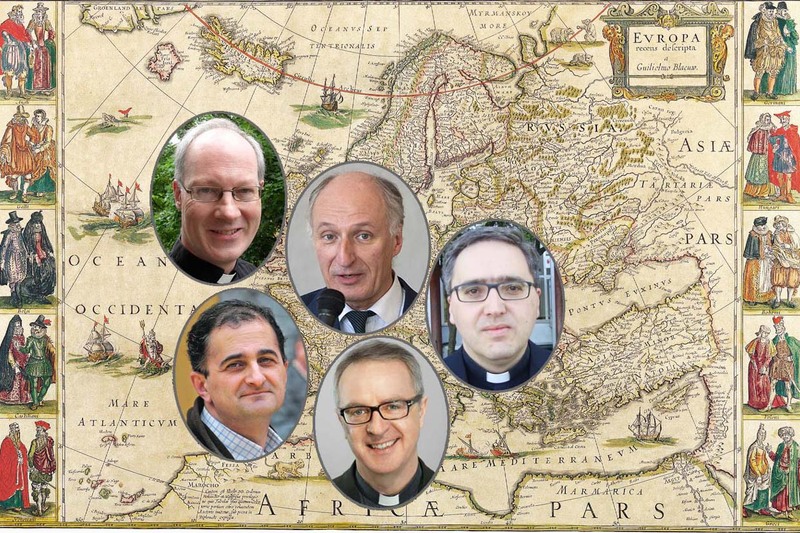 Nine Flemish Jesuits are outside the province, of whom one in Amsterdam.